Charles' nice leather Libelle pen wrap and his everyday carry (EDC) pens---a blue-striped Pelikan M800, a Montblanc 149 highlighter, a Diplomat Excellence in the Guilloch Rhombus pattern and a Bexley Poseidon in Tortoise. I believe the red/maroon pen on the far left is a British Parker Duofold. All great choices for daily carry pens! Who says a (very) limited edition pen can't be an ED carry? This is Bruce's impressive CONID Bulk-filler, limited to 60 pieces worldwide. 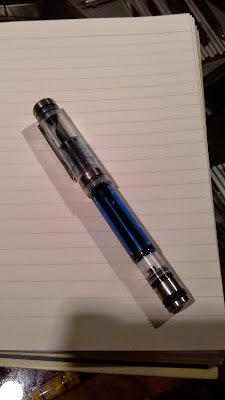 Bruce says he loves using his TWSBI Vac 700 when he needs a "casual" pen, and his OMAS Dama on more "dressy" occasions. I forgot to photograph my own EDC, but I took a quick shot at home after the meeting. From L to R: Pentel retractable eraser, Paper Mate Precision pencil, Romet Americana ballpoint, Cross Bailey ballpoint, Online Academy fountain pen and Laban Mento fountain pen (I carry these in a leather Signum multi-pen pouch). All in all, the topic of EDC writing instruments was well-represented at our May meeting. In addition to fountain pens, other types of writing instruments were brought in---mechanical pencils (e.g. Dave's Parker '51' and Dexter's Staedtler 925 25 2mm pencil), ballpoints (Bill K's Parker Jotter, Dexter's Rotring, and others), multi-pens (Bill's Cross Tech3) and even some brush pens & other art pens used for sketching (brought in by Adrian). 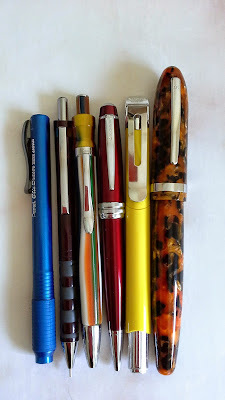 Fountain pens, however, were (by far) the most popular EDC writing instrument (seeing as how we're primarily a fountain pen club, that should come as no surprise!) 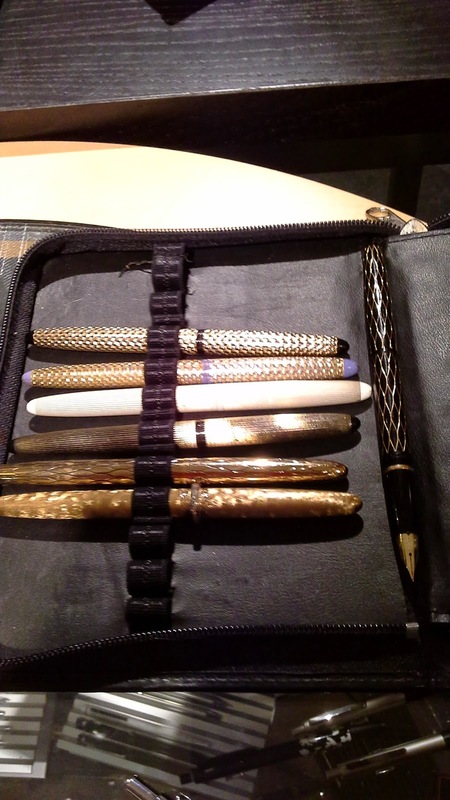 with examples by Lamy (Bill's Nexx & Safari), Parker (Mark & Dave's '51's and Graham's '21'), Sailor (Peter's '1911'), Pilot (Sienca's Petit collection, James' Prera and Peter's Vanishing Point), Platinum (a '3776' belonging to Peter), Pelikan (Stuart's M200, among others), Noodler's (a 'Nib Creaper' model owned by Stephanie), Montblanc (Graham's '14') and Sheaffer (Stuart's Sagaris). VPC member Tony brought in his everyday pen---a nice-looking black no-name fountain pen with his name engraved. 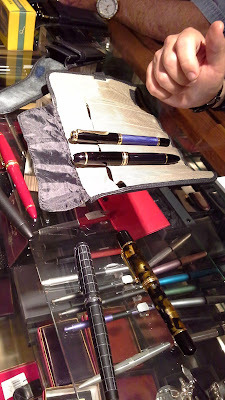 Newer member Kiyoshi brought in a couple of nice Chinese-made fountain pens and Mido brought in an assortment of wonderful vintage fountain pens from the "Big Four"----Waterman, Wahl-Eversharp, Parker & Sheaffer. ~~~~~~~~~~~~~~~~~~~~~~~~~~~~~~~~~~~~~~~~~~~~~~~~~~~~~~~~~~~~~~~~~~ Thanks to all 22 VPC members who came to the May meeting, including our two newest members---Marey and Peter! Next VPC meeting will be held on Thursday June 19 at the usual meeting place (Perks pen store on Cambie Street in Vancouver). Meeting time: 6:30pm to 8:30pm (approx.) Theme: to be announced!